The Testing Framework provides you with an easy way to test your SAS® metadata security implementation by comparing your current set-up against a baseline set of metadata definitions. 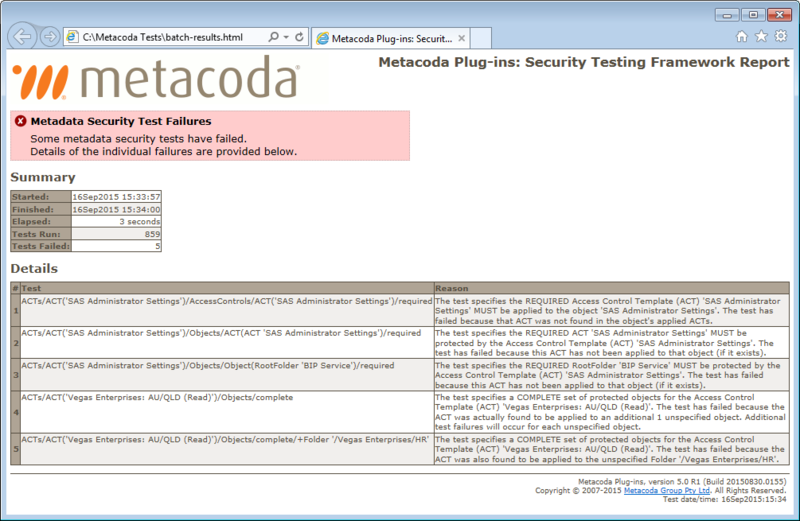 The Testing Framework is an optional component included in our Metacoda Security Plug-ins software. It is comprised of a Batch Interface and Test Runner. To protect the integrity of your current metadata security implementation, you can use the Testing Framework to easily create a set of XML test specifications and then check for any changes or concerns. The Batch Interface allows you to schedule regular metadata security tests to detect deviations from this implementation and report back on the results. The Test Runner performs the same tasks interactively. You can also set up email alerts to draw your attention to any concerns. Run tests from XML files: the Test Runner plug-in processes XML test specification files exported from the ACT, User, Group, Role, Capability, Protected Object and Internal Login Reviewers, as well as the Identity and Object Permissions Explorers. These files are used to set the baseline metadata security implementation and check for future deviations. Test specifications can also be created and run in batch. Set up regular tests in batch: use the Batch Interface together with popular schedulers to regularly check the current metadata security implementation and easily view any issues. Create email alerts: problems and concerns can be flagged using email alerts. View test results interactively: test results can be run and reviewed interactively, the test results tab helps you to examine and understand any failures. HTML export: reports generated by the Metacoda Testing Framework can be easily exported in HTML format for documentation, audit and troubleshooting purposes. 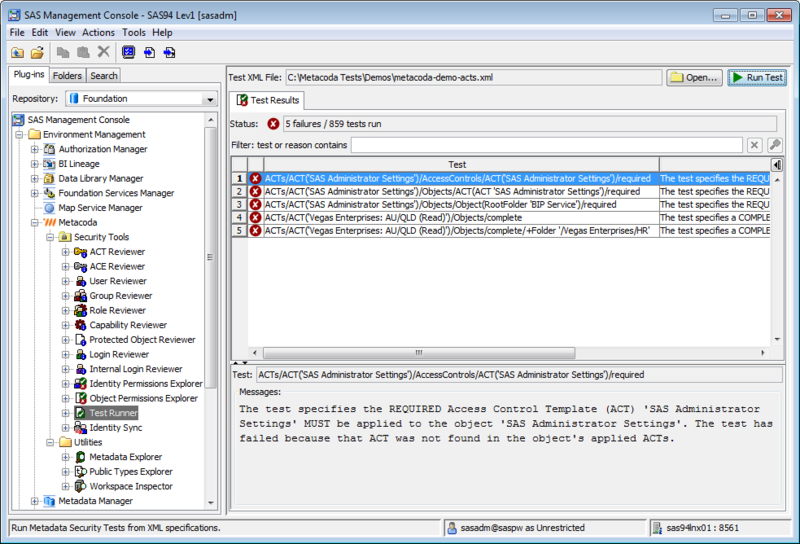 Export a baseline metadata security implementation to XML test files. Schedule regular security checks in batch, easily viewing any deviations from the baseline and being alerted to potential issues via email. Run tests interactively, viewing and examining any failures. The Testing Framework is available in our Enterprise level package. We offer three license package levels: Starter, Premium and Enterprise. Read our licensing page to find out which package is best for you.